Traditional and Original Irish/Celtic Music with a Jazzy Flair. A native Floridian, Rick has been performing professionally since 1979. His contributions as a musician have included over 17 years as principal musician for King Henry's Feast, a dinner theater show in Orlando, Florida performing English and Irish folk music. He also performed for five years as the Fiddler for the "Porchdogs" a Florida based Cajun and Zydeco/Blues Band performing for Disney, Universal Studios, and concerts all over Florida and the Southeast. 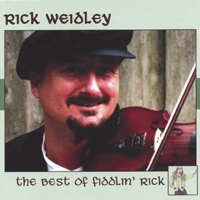 Rick has also been seen in numerous Jazz ensembles playing Electric Violin creating a colorful blend of Jazz, Folk, Rock, and Blues. He has an extensive background in Harmony, Arranging and Composition, weaving an ever changing warm sound into all the music he creates. Rick also performs with other bands, including the Bayou Teche Band, a rockin' cajun/zydeco band. All bands can be heard regularly all over the state of Florida and the southeast. He is available as a studio musician, able to compose, arrange and produce CD's of the highest quality. Check out more photos of Rick at work in the studio, and in performance costume. Rick is also available to perform live either with a band or as a solo performer. He can easily play any musical style including popular, Jazz/blues, Cajun, Country Rock or Irish/Celtic which is his favorite. No matter what style, you can be sure Rick's versatility and talent will be just what you're looking for! We're sure you'll love what you hear!